The Latest, But Is It The Greatest? 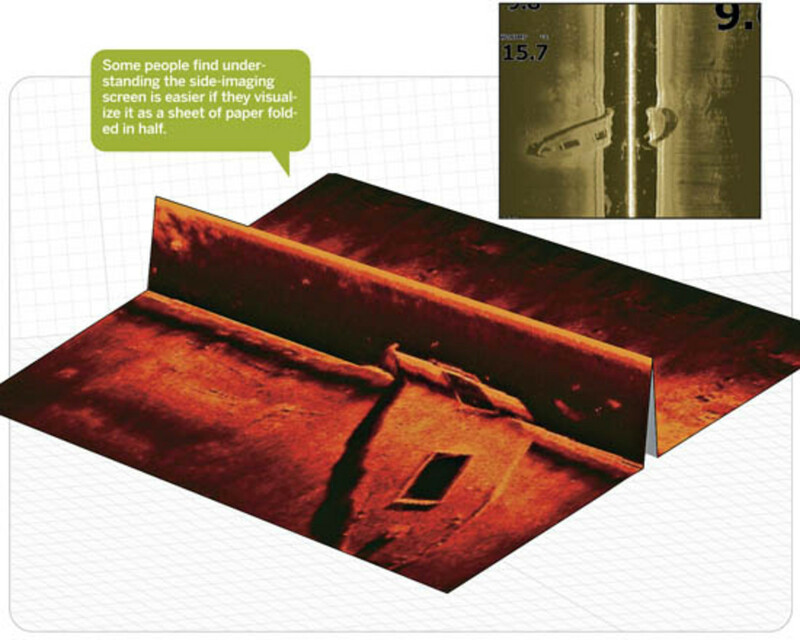 Side-scan sonar can find structure, but can it find fish? Teamwork in action: Using side-scan, down-scan, and regular sonar to help pinpoint a wreck and ultimately find the fish. Half a century ago, Carl Lowrance revolutionized fishing by producing the first transistorized fishfinder. 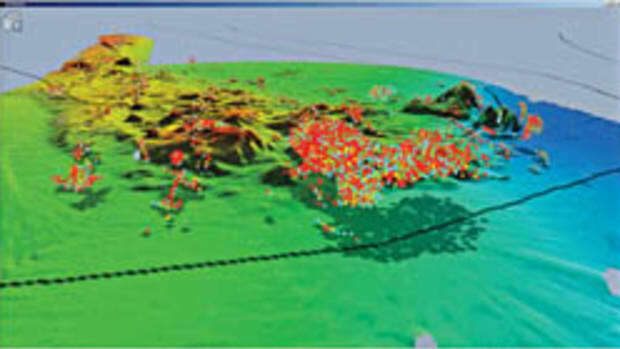 Technology has certainly moved on since then, but even with the latest side-imaging fishfinders, the goal is the same: produce accurate images of the seabed and structure that are of almost photographic quality. Lowrance did that by using brand-new transistor technology, and in doing so, brought sonar within the reach of thousands of ordinary American boaters. His Lo-K-Tor worked by transmitting very short pulses of extremely high-frequency sound—far too high for human ears to hear—and listening for the echoes produced when those pulses were reflected from the seabed, structures such as wrecks and rocks, or ideally, fish. 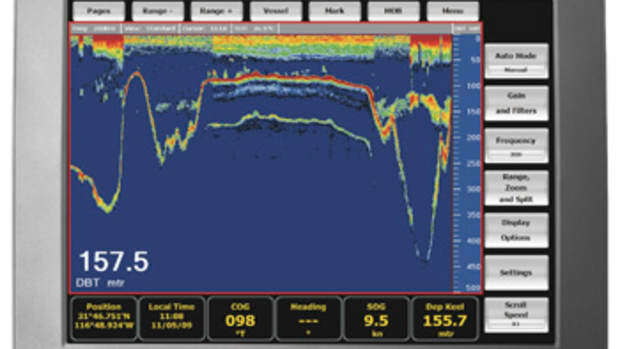 Humminbird’s zoom feature [1&2] shows off the detail that can be achieved in these sound pictures. 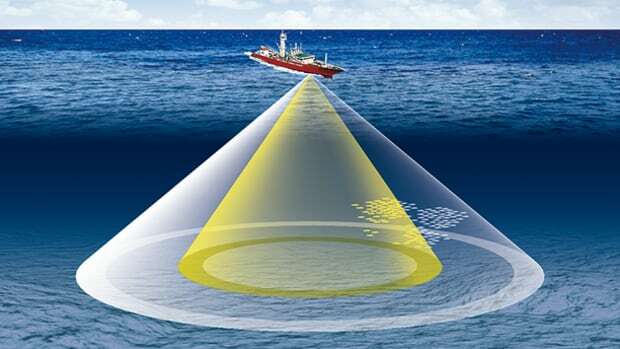 High-definition “down-scan” sonar  is a spin-off from the high frequencies required to make side imaging work. Sound waves travel at nearly 5,000 feet per second in water, so if an echo came back one-hundredth of a second after a pulse was transmitted, it meant that whatever reflected the pulse must be 25 feet away. The Lo-K-Tor instantly performed those kinds of calculations and displayed the returning echoes as flashes on a circular dial, with the position of each flash corresponding to the depth at which each echo was produced. Ice fishermen still use such “flasher” sounders that look very much like the Lo-K-Tor and use exactly the same principle. Internally, of course, they are much more sophisticated, but to their users, the main difference is that modern ice-fishing sonars use different colors to distinguish between weak, strong, and medium echoes. Many regular fishfinders present the same information in an A-scope display, usually down the right-hand side of the main display. It’s just like the flasher display except in a vertical line instead of being bent around in a circle. 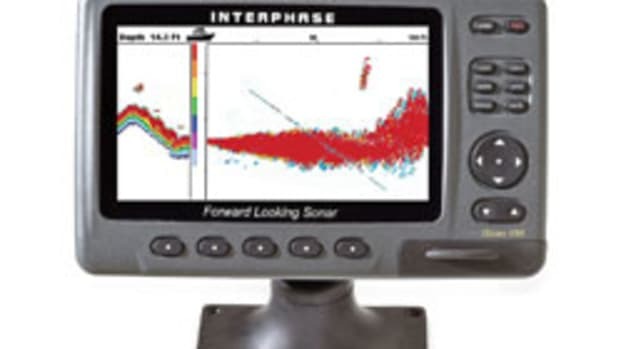 The main part of a fishfinder display, however, is taken up by a graphic that shows just how much the A-scope display has changed over the past few seconds. 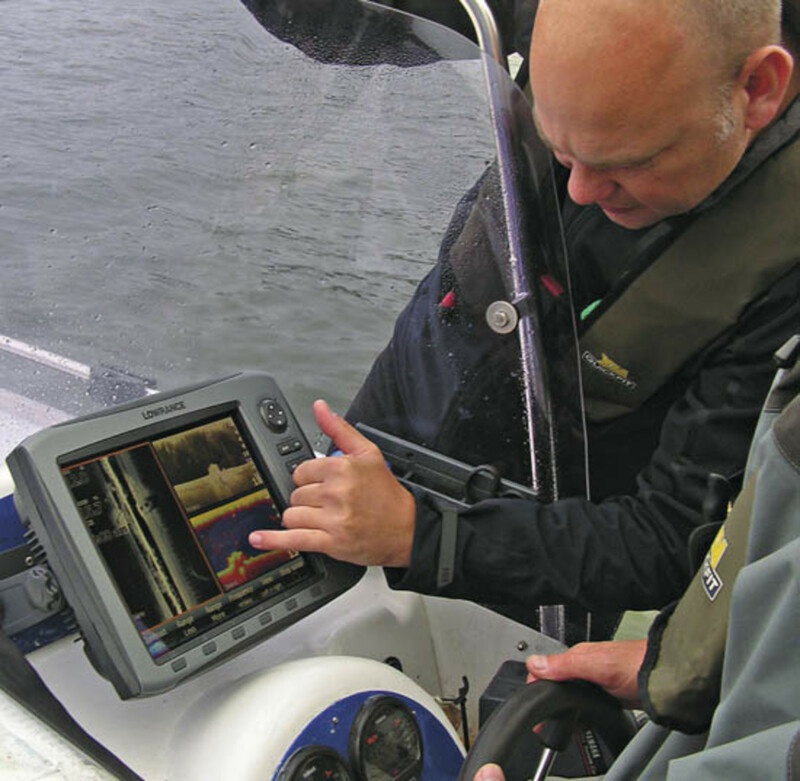 You can think of the familiar fishfinder display as being made up of lots of vertical strips. The one on the right represents the echoes received from the most recent pulse; the one just to the left of it represents the echoes from the previous pulse, and the one to the left of that represents the echoes from the pulse before that. And so on. 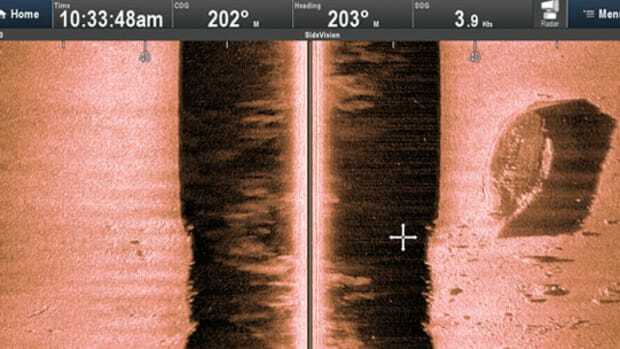 A side-imaging sonar does exactly the same thing except that its transducer (the component on the bottom of the hull or on the transom that broadcasts the signal) is designed to produce two fan-shape beams of sound, one on each side of the boat, instead of the vertical, cone-shape beam of a conventional sonar. The software rotates the resulting picture ninety degrees so that the boat’s direction of travel is straight up on the screen instead of from left to right. For instance, suppose that the seabed to port is flat, featureless sand. Most of the sonar energy will ricochet off the sand and not be bounced back towards the boat, but some of it will be scattered back, to be picked up by the transducer as a weak, drawn-out echo. On the screen it will appear as a light gray line across the top of the left-hand side of the screen. High-frequency down-imaging  shows great detail, but fish viewed using it are less obvious than they are on a conventional sonar display. 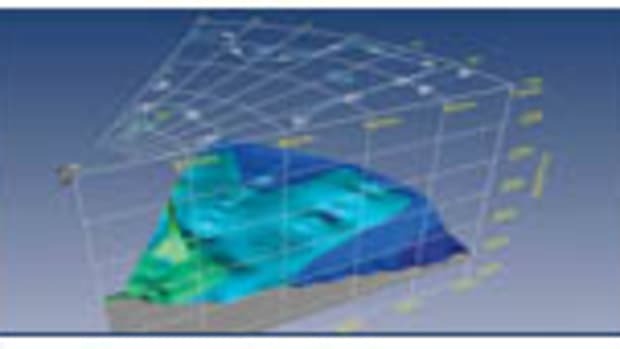 Side-imaging  and down-imaging  will clearly show wreckage on the seabed but are not as good as conventional sonar at finding fish. The display software moves that faint gray line down the screen so that when the transducer transmits the next pulse and receives the next faint, drawn-out echo, there’s room to draw another faint gray line on top of the first one. Gradually, over a few seconds, the left-hand side of the screen becomes a flat gray color corresponding to the flat seabed, with a dark band down the center of the screen whose width depends on the depth of the water. At the same time, the same thing is happening on the starboard side, producing a mirror image on the right-hand side of the screen. But suppose that on the starboard side there’s a large concrete block on the seabed. Its near-vertical sides will reflect sonar energy back to the transducer far more strongly than the surrounding sand, so the edge of the block appears on the screen as a much brighter, stronger echo. At the same time, the block will prevent sonar energy from reaching the sand beyond it, so the weak echo from the sand will disappear. As the boat moves past the block, the picture on the screen builds up to show the vertical side of the block as though a bright light, with a dark “shadow” beyond it, was lighting it. If all this sounds complicated, believe me it is much easier to see than to describe. 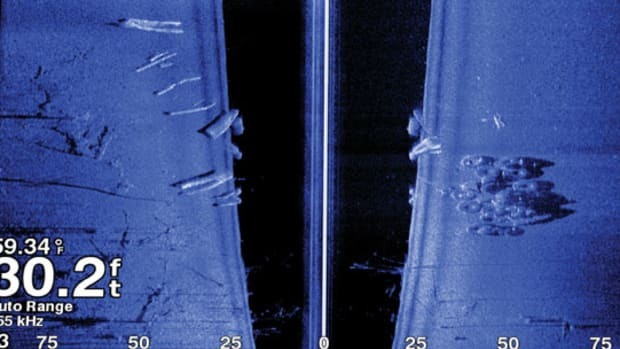 The images produced by side-imaging sonar are the next best thing to underwater photographs—better in some respects because they don’t rely on light and are almost completely unaffected by cloudy or muddy water. Amateur experimenters have built their own side-imaging sonars using clusters of regular transducers with surprisingly good results—in a rather geeky, proof-of-concept way. 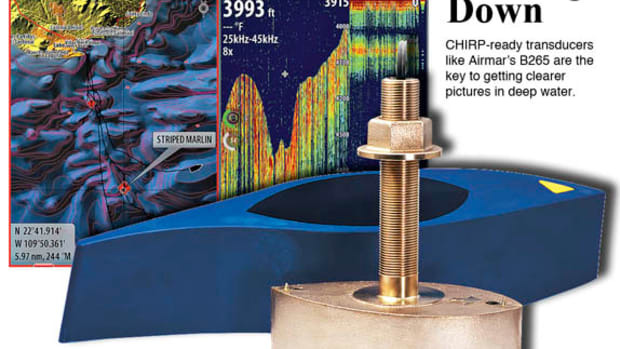 But what has made this basic principle into a practical commercial product and a valuable tool for anglers is that production side-imagers use significantly higher frequencies than regular fishfinders. As a rule of thumb, if you want to produce a narrow, concentrated beam of any kind of energy, you need either a big “radiator” (i.e., transducer), a high-frequency, or both. That’s why long VHF antennas are better than short ones, why big radar scanners produce clearer pictures than small ones, and why radar scanners designed to operate at low S-band frequencies need to be bigger than those intended for higher X-band frequencies. It’s also why those “fish arches” on a regular dual-frequency fishfinder tend to be larger and more obvious on the lower frequency. So in order to achieve a fan-shaped beam that’s only a degree or so wide in the fore-and-aft direction but anything up to eighty degrees wide in the side-to-side direction, the makers of side-imaging sonar use long, thin transducers and much higher frequencies than usual. 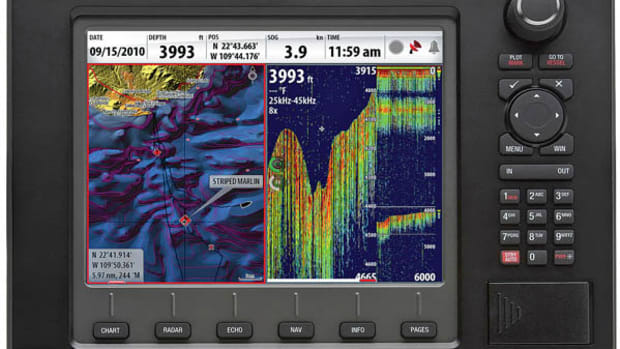 For instance, Humminbird’s sidescan units operate at 455 kHz and 800 kHz, compared with the 83 kHz and 200 kHz used by conventional fishfinders. The funny thing is that the use of high frequencies for side-imaging has given us a spin-off benefit: “down-imaging” sonars. They do exactly what their name suggests: look downward just like regular fishfinders. But because they use higher frequencies, they’re able to produce far more detailed images of structure on the seabed below the boat. So does all this make regular fishfinders obsolete? Not at all. Side imaging is very good at producing pictures of the underwater world but very bad at measuring things: With practice, you may be able to estimate how big a feature is or how far below the surface it is, but you can’t measure it accurately. And although side imaging is very good at showing the places where fish are likely to be, it’s not so good at spotting the fish themselves. It doesn’t produce those enlarged fish arches that many fishermen expect to see on a fishfinder. So although very big fish show up okay, smaller fish show up as mere specks.